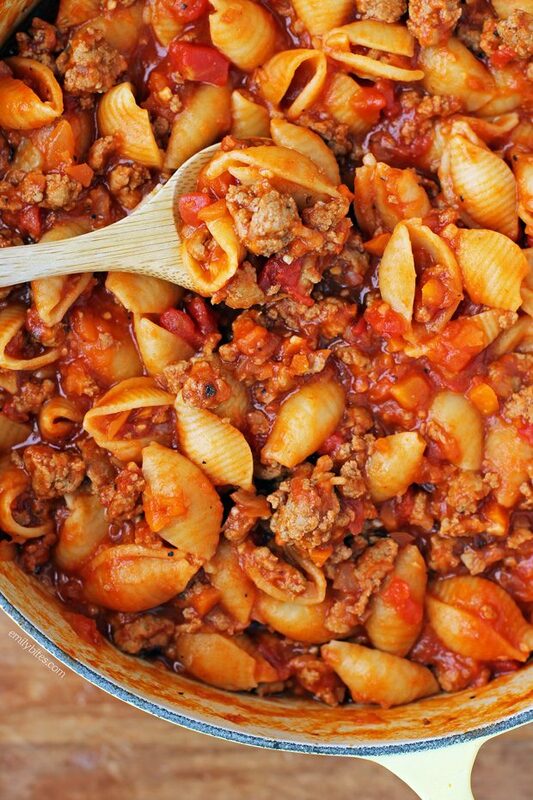 This one-pot Turkey Sloppy Joe Pasta is simple to make, super satisfying and full of flavor. I love that it all comes together in one pot (who wants to do tons of dishes?) and it makes a lot – perfect for leftovers! 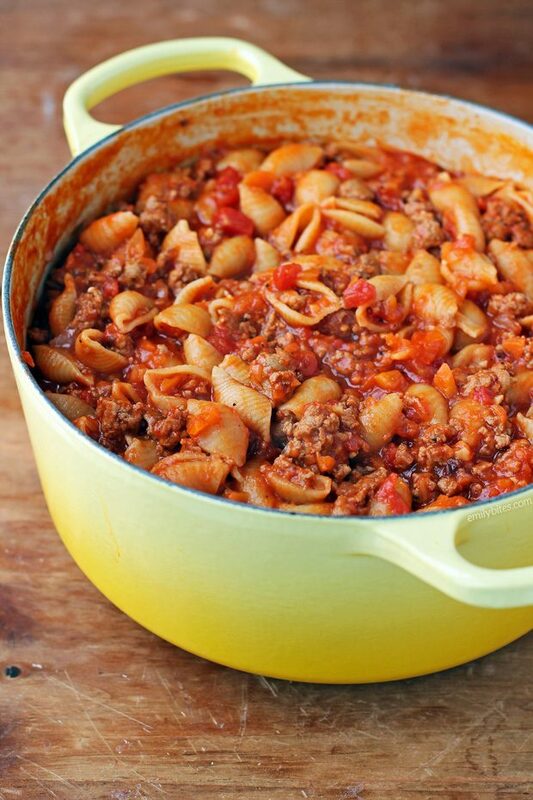 Since my Beefy American Goulash is one of my most popular recipes, I used the process for that as a starting point and added the sloppy joe flavors and seasonings from my Deep Dish Sloppy Joe Casserole. It’s a recipe mashup that was meant to be! This Turkey Sloppy Joe Pasta is also full of hidden veggies like carrots, onions and mushrooms, so it’s a great way to sneak in some healthy vegetables to skeptical kiddos in a way they’re sure to love. This recipe makes big, hearty servings and it’s hard to believe they’re just 359 calories or 5 Weight Watchers Freestyle SmartPoints each! 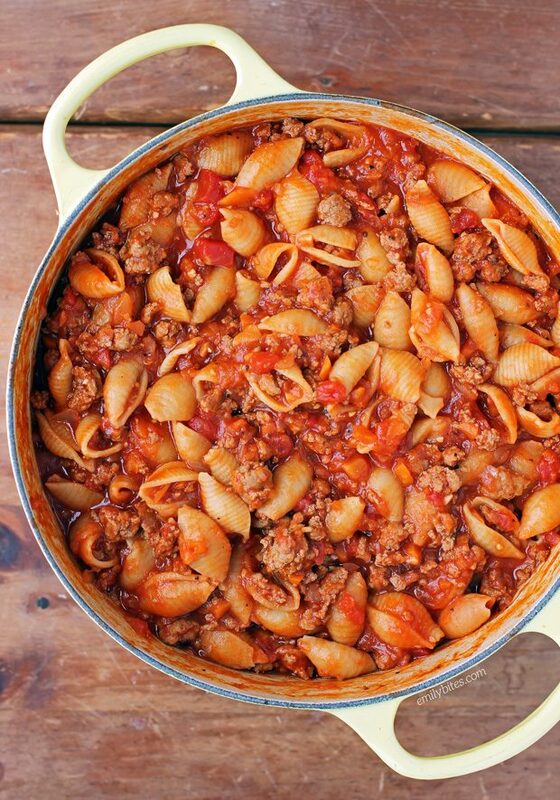 The whole pot of Turkey Sloppy Joe Pasta makes about 15 cups total, so each filling serving is just under 2 cups. That’s a whole lot of satisfying comfort food! Looking for more lightened up comfort food pasta dishes? Check out the pasta section of my recipe index for favorites like Chicken Pot Pasta, Beefy American Goulash, Beef Stroganoff, One-Pot Cincinnati Chili Spaghetti Bake, Sausage Ricotta Pasta, Lemon Chicken Orzo, Italian Wedding Pasta Skillet, Slow Cooker Kickin’ Chicken Pasta, Beef and Sausage Manicotti, Pumpkin Alfredo Tortellini Skillet, Spinach and Artichoke Lasagna Roll Ups, Chicken Cordon Bleu Pasta Bake, Tomato Soup Mac & Cheese, Spaghetti Pie, Sausage Tortellini Skillet, Buffalo Chicken Lasagna Roll Ups, Chicken Parmesan Stuffed Shells, Spicy Sausage Pasta and many more! Lightly mist a large dutch oven or soup pot with cooking spray and bring over medium heat. Place the ground turkey in the pot and cook, breaking up with a spoon or spatula. Add the Montreal Steak seasoning and stir in. Cook until the turkey is cooked through and in small pieces. Add the carrots, mushrooms, onions, garlic, vinegar and Worcestershire sauce and stir together. Continue to cook for another 5 minutes, stirring occasionally or until vegetables are softened. Add the water, tomato sauce, diced tomatoes, tomato paste, brown sugar and cayenne pepper and stir together. Bring to a boil and then reduce heat to low. Cover the pot and simmer for 15-20 minutes. Add the pasta and stir until well combined. Re-cover the pot and simmer for 20-25 minutes until the pasta is cooked through. Remove from heat, stir and allow to sit for 15 minutes uncovered before serving. This looks GREAT but makes so much! Do you think it would freeze well? Also, what about adding some red and yellow peppers? I haven’t tried freezing it so I can’t say for sure but you could certainly try halving the recipe to make less! I despise bell peppers personally but I think they would probably work well in this if you like them :). I just cannot make myself buy yet another bottle of seasoning mix that I’ll only use rarely. My spice cabinet is already bursting at the seams! Can you tell me what’s in the McCormick Steak Seasoning? Surely with the many, many spices I already have, I can create my own (approximate, at least) substitute. I think this recipe looks wonderful, and I can’t wait to make it! Thank you! Hi Mary Beth, I can’t say for sure what the spice blend is but a quick Google search of Montreal steak seasoning gives several copycat recipes if you’d like to try one! What brand of pasta shells do you use, that keeps the point value so low? This looks delicious! And I love a good one-pot dish! Could you tell me what the Smart Points come to? Thank you. I made this last night for me and my husband – it was INCREDIBLY delicious! I have never tasted something so yummy before! The best part was my husband actually savoured the flavours instead of just plowing through like a vacuum cleaner. I made some small variations, just due to what I had available in my pantry. For one, I left out the tomato paste and just used my tomato sauce instead. I diced fresh tomatoes instead of using canned. I had leftover ground beef in the freezer, so I used that instead of turkey breast. Just before serving, I added some shredded marble cheese and let it melt everywhere – divine! For me, this was a real cheat meal actually, because most of my meals are ketogenic. I found that adding the cheese was helpful because it bulked it up enough to keep me full all night. Thank you so much Emilybites for an amazing recipe! I’ll be adding this to my recipe book for sure! It’s 9 smart points when I calculated it on the ww app. Hrmm. You can’t calculate the points for recipes using the nutrition information and the points calculator, you have to use the recipe builder. The recipe builder will not count values for the zero point foods but those foods of course still have calories, fat, sugar, etc which will lead to a higher points value per serving. Hope that helps! Ok added what I got to use to make it in the recipe builder and it’s 6 points a serving for what I have 🙂 much better. Made last night and it was fantastic! So good! Husband and I loved it — this will be in our rotation for sure! Thank you! This was a hit with my husband and kids! I had to modify it a bit though because I didnt have time for all of the simmering.. I halved the recipe, omitted the water, and used a 28oz can of tomato sauce to replace the 2 15 oz cans of sauce and diced tomatoes (because God forbid, vegetables). I cooked the pasta seperately on the side while the sauced simmered a bit and combined it all to serve. I made the meat mixture ahead of time so that was done as well, plus no one saw me blend up veggies to add either! Another quick weeknight meal in our rotation! thank you! I made this last night, and oh, my! It really is delicious and filling! My only alteration to the recipe was to duplicate the spices in the McCormick blend (per Goggle search) because I had them all in my pantry already. I halved the recipe (since it’s just me at home) and there are plenty of leftovers! Thanks for another GREAT recipe!! Hi Emily! Is SmartPoints for this recipe the same as freestyle points? I built this recipe in the builder and set it to 8 servings and it came to 4 points per serving! Just doesn’t seem possibly that that’s right for such a large serving! Can’t wait to make dinner tonight! I’m not 100% sure what you’re asking so let me attempt to clarify. The current Freestyle program uses SmartPoints so the freestyle smartpoints are listed and you can use the recipe builder to determine them. Under the current program, ground turkey breast etc are zero points so that makes this a low point option! If you’re asking about the SmartPoints under the previous program, I have no way of calculating that now that the WW recipe builder has switched over. Made this tonight and it was delicious! It makes a ton (even for a family of five), though, so next time I will half it. The cayenne adds a little kick, which my kids weren’t too crazy about, but I loved it! My family of six all loved this. That’s very rare in our house – great recipe! 2-15oz cans of tomato sauce.. so total 30 oz? Just checking! I heard about your site at a WW meeting. I made this tonight, it was delish!!! Kids loved it. I halved the amount of pasta to make it a bit lighter. We will omit the cayenne next time — a little too spicy for our tastes. Thanks for the recipe, i’m looking forward to trying more! Made this tonight and WOW! Very easy and filling! We added Trader Joe’s FF Feta and are currently in pasta & cheese heaven. This recipe is definitely a keeper! I made this on Wednesday. Today is Friday and the picky young adults in my house are already asking when I am making it again. So flavorful! Congratulations on your beautiful bundle of joy. Wishing you a lifetime of wonderful memories. Why are the points value different for the points plus and smart points? I am following the new freestyle program. What is the points value for that? The freestyle program uses SmartPoints and the freestyle SmartPoints are listed. PointsPlus was a previous program and used a different calculation. Really enjoyed this recipe. Easy & yummy. Congratulations on your bundle of joy! This was a great recipe! We loved it!!! For anyone wondering, the Freestyle Points conversion for this recipe is 4 points per serving (~2 cups). I used the recipe builder on the app to calculate. I’ve already listed the freestyle smart points at the end of the recipe. Every one of my recipes lists the freestyle smartpoints! Update: I am dumb and didn’t remember to use the recipe builder! IT IS NOW 2 SP IN FREESTYLE!!!!!!!!!!!!! For a 2 cup serving!!! What?!?! You are a genius. I have lost count how many of your recipes I have made as I am on WW. I love the way you cook the spices and put a kick in them. I don’t look anywhere else for things to make. The convenience of always applying the points is monumental. Thank you Barbara. I am trying to halve this recipe and when I enter the 6oz of pasta it only gives me the option of cooked in the recipe builder, I am coming up with 9 points per serving. I am so sure I am doing something wrong. The ground turkey I have is 14 point for the whole pound but that cannot possibly be why it’s so much higher? Makes a lot which is nice. Way too spicy! Maybe the cayenne. Maybe the combination of cayenne with Montreal Steak seasoning? I was disappointed, because we love Beefy Goulash. I made this recipe for dinner tonight and it was amazing! I have recently become an instant pot fan so I did tweek it to cook in the instant pot instead of on the stove and it turned out great. Thanks for the wonderful recipe. This recipe saved my life! Yes – a bit dramatic, but I wasn’t enjoying anything I was cooking and I’m on WW, so making healthy AND yummy foods is important to me. Then, THIS recipe happened to me! I am sensitive to spicy foods, so I omit the cayenne, but leave everything else as is. It makes a large pot so I have dinner for days – which as a single gal, I absolutely love. I thank you, Emily, from the bottom of my heart and cannot wait to try your other recipes! This is AMAZING! It hits all the notes for me for a satisfying comfort food. I have recently started Weight Watchers (for the fourth – and I am determined the last – time) and I have become addicted to your recipes. This does make a lot, but I chose to make the entire recipe. I used to make a much higher fat version and it froze well. It is much less costly than the frozen WW meals you buy and they freeze well so I figured why not this? Plus, let me reiterate, this is AMAZING! Thank you for the time you invest in creating or tweaking recipes and putting them on Pinterest. I certainly appreciate all you do. Soooooooo good!!! I cut the recipe in half and prepped for dinners this week. I tried a little bit tonight and OMG SO GOOD!! Your recipes have made sticking to weight watchers so easy. I haven’t tried a recipe yet that I haven’t liked. 1= A turkey sloppy joe! Hi emily! Love your recipes! I do not have a food processor or chopper and so I bought julienne carrots to mince easier, do you know about how many cups of carrots I need since I am not using whole ones? I thought this was just mediocre and the shells were over cooked. I’d suggest eliminating the 3 cups of water and just cooking the pasta separately. 20 min is way too long. Or just shorten the time to what it says on the box. Also, wouldn’t chop up veggies, and definitely would add peppers. Sloppy joes always have them. Would add more seasoning. Might try again with changes…. This was so good! I used Trader Joe’s seasoned salt instead of the the Montreal Steak Seasoning and added a can of drained black beans to boost the fiber. I had a green pepper in the fridge needed to be used, so in it went. Before it was time to add the pasta I took out half the mixture, let it cool and put it the freezer for another day. Then added 6 oz pasta to the pot and finished cooking. Thank you Emily, your recipes are make sticking to the plan so much more enjoyable!